At the invitation of Premier Li Keqiang of the State Council, Prime Minister Hun Sen of the Kingdom of Cambodia will pay an official visit to China from May 13 to 17 during his attendance at the Belt and Road Forum for International Cooperation. During Prime Minister Hun Sen's visit to China, he will attend major activities of the Belt and Road Forum for International Cooperation. There will also be meetings and talks with President Xi Jinping, Premier Li Keqiang, Chairman Zhang Dejiang of the NPC Standing Committee and Chairman Yu Zhengsheng of the CPPCC National Committee. He will also attend China-Cambodia business trip forum. We hope and believe that his visit will help consolidate traditional friendship between the two countries and push forward our comprehensive strategic cooperative partnership. China and Cambodia are neighbors enjoying traditional friendship, and established comprehensive strategic cooperative partnership in 2010. There are frequent high-level exchanges and fruitful cooperation in different fields between the two countries. In 2016, President Xi Jinping and King Sihamoni visited each other, and Premier Li Keqiang and Prime Minister Hun Sen had three meetings. All these gave a strong boost to the growth of bilateral relations. We believe that the bilateral relationship will achieve steady and all-round progress under the concerted efforts of both sides, delivering benefits to the two peoples and contributing to regional peace, stability and development. At the invitation of Premier Li Keqiang of the State Council, Hungarian Prime Minister Orban Viktor will pay an official visit to China from May 12 to 16 during his attendance at the Belt and Road Forum for International Cooperation. During his stay in China, President Xi Jinping, Premier Li Keqiang, Chairman Zhang Dejiang and other leaders will meet and hold talks with him to exchange views on the bilateral relationship, the Belt and Road, China-Central and Eastern European countries cooperation and issues of common interest. Hungary is one of the first countries to recognize and establish diplomatic ties with the new China. China and Hungary enjoy a long history of traditional friendship, vigorous practical cooperation and close people-to-people exchanges. The current relationship is faced with new opportunities. We believe that Prime Minister Orban's attendance at the Belt and Road Forum and official visit to China will help strengthen political mutual trust, complement each other's development strategies, advance the building of the Belt and Road, promote cooperation between China and Central and Eastern European countries, expand exchanges and cooperation in various fields and elevate the bilateral relationship to a new height. Q: The ROK national election commission announced the result of vote counting on May 10. Democratic Party candidate Moon Jae-in was elected as new ROK president. What is China's comment on that? Does China want to work with the new ROK administration to improve the bilateral relationship? A: President Xi Jinping has sent a message to President Moon Jae-in, congratulating him on becoming the 19th president of the ROK. President Xi Jinping said in the message that the Chinese side attaches great importance to the ROK and the relationship with the ROK, stands ready to work with the ROK side to uphold the hard-won outcomes of the bilateral relationship, consolidate political mutual trust, properly address differences, enhance coordination and cooperation and push for the sound and steady growth of the relationship based on mutual understanding and mutual respect. Q: It is said that the US once told China that they would arrange for a meeting with the DPRK if the latter stopped nuclear tests. Is that true? What has China done to facilitate direct communication between the US and the DPRK or multilateral talks? A: Similar questions have been raised to us these days. First, it is China's long-standing position that the nuclear issue of the Korean Peninsula should be peacefully resolved through dialogue and consultation. We have been in touch with all relevant parties, encouraging them to increase communication and contact and make joint efforts to bring the issue back to the track of dialogue and consultation. 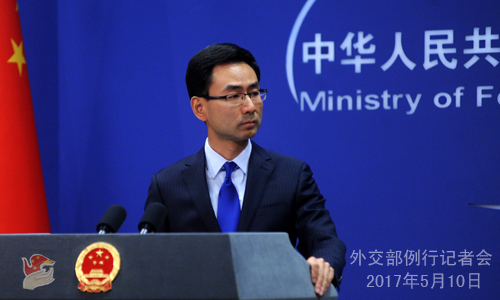 Second, the Chinese side has noted remarks by the US on the nuclear issue of the Korean Peninsula, as well as the positive message conveyed through the remarks of peacefully resolving the issue through dialogue and consultation. We believe that relevant parties have also noted the remarks and the message, and will take them seriously. Third, we have been stressing that the US and the DPRK, as parties directly concerned to the nuclear issue of the Korean Peninsula, should demonstrate their sincerity to each other and gradually build up mutual trust. It is hoped that the two sides will join China to bring the nuclear issue of the Korean Peninsula back to the right track of peaceful settlement through dialogue and consultation. Follow-up: You just said that relevant parties have also noted the message and will take it seriously. Are you referring to the DPRK? Has China ever communicated with the DPRK about the message? A: The Chinese side is in close communication with all relevant parties. Q: China has announced that President Shavkat Mirziyoyev of Uzbekistan will pay a state visit to China and attend the Belt and Road Forum for International Cooperation. Can you tell us more about the arrangements? How do you comment on the current China-Uzbekistan relationship? A: At the invitation of President Xi Jinping, President Shavkat Mirziyoyev of Uzbekistan is coming to China for a state visit and the Belt and Road Forum for International Cooperation from May 11 to 15. President Xi Jinping will hold talks with him, and jointly sign and release the China-Uzbekistan joint statement. Premier Li Keqiang and Chairman Zhang Dejiang will meet with him. Leaders of the two countries will have in-depth discussions on the bilateral relationship, comprehensive cooperation and international and regional issues of common interest. It is believed that the visit will add new impetus to China-Uzbekistan comprehensive strategic partnership. President Mirziyoyev will also attend the Belt and Road Forum for International Cooperation. Uzbekistan is a major country in the building of the Belt and Road. We welcome its active participation in the Belt and Road cooperation, so as to realize common growth and prosperity. Q: This Sunday, China will host the Belt and Road Forum for International Cooperation. The European Union delegation in Beijing says that the Commission Chief of the EU Juncker has not been invited by China. Can you confirm that and tell us why? Does this demonstrate a change in China's attitude towards the EU? A: Foreign Minister Wang Yi has made a preliminary introduction of all parties' attendance at the Belt and Road Forum for International Cooperation in a recent briefing. The detailed name list will be released in due course. What I want to stress is that the Belt and Road initiative is an open and inclusive initiative. We welcome the active participation of all relevant parties to make joint efforts for the growth of world economy and better livelihood of people around the world. Q: China announced the visits by Chilean and Argentine presidents to China and their attendance at the Belt and Road Forum for International Cooperation. Can you brief us on their visits and China's relations with Chile and Argentina? What is China's opinion on the participation of Chile, Argentina and other Latin American countries in the Belt and Road initiative? A: Both Chile and Argentina are China's important cooperative partners in Latin America. Last November, President Xi Jinping paid a successful state visit to Chile, and announced together with President Bachelet the establishment of China-Chile comprehensive strategic partnership, which ushered our bilateral relations into a new stage of development. Last year, President Xi Jinping had two meetings with Argentine President Macri and reached important consensus on strengthening friendly and win-win cooperation across the board, thus charting the course for the development of our relations. China attaches great importance to developing friendly and cooperative relations with Chile and Argentina. We would like to take the visits of the two presidents as an opportunity to further deepen the friendly and win-win cooperation across the board with Chile and Argentina and advance the two pairs of comprehensive strategic partnership. The Belt and Road initiative, proposed more than three years ago, has also been drawing broad attention in Latin America. Many countries, including Chile and Argentina, have expressed positive attitude of participation. The Belt and Road initiative is open and inclusive. We welcome the active participation of Chile, Argentina and other Latin American countries to strengthen complementarities between their development strategies and practical cooperation in various areas. In this way, the Belt and Road initiative can better contribute to China-Latin America cooperation and world stability and prosperity. Q: The new ROK President Moon Jae-in said that he would have consultation with China and the US on the THAAD issue. What is China's comment on that? A: China's position on the THAAD issue is clear and consistent. We hope that the ROK side can pay attention to China's concerns and properly settle the issue. Q: A US congressional delegation led by the Democratic Leader of the House of Representatives Nancy Pelosi met with the Dalai Lama in India on May 9. Does China consider this a signal of the administration's policy towards Tibet? What is China's comment on that? A: We have noted relevant reports. The 14th Dalai Lama, under the cloak of religion, is a political exile who has long been engaged in anti-China activities aimed at splitting the country. He is the ringleader of the group advocating the so-called "Tibet independence". The meeting between the US congressional delegation and the Dalai Lama in Dharamsala has sent an awfully wrong signal of supporting "Tibet independence", and violated the US commitment of not supporting "Tibet independence". 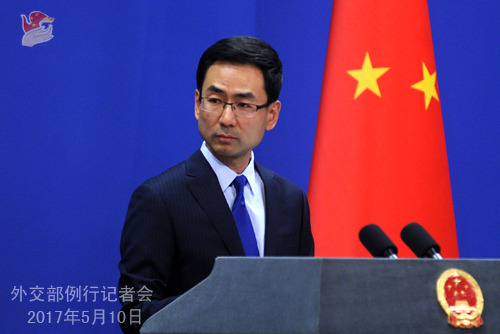 China has expressed firm opposition and lodged serious representations with the US side. We urge relevant congressmen to be prudent in dealing with Tibet-related issues, stop any forms of contact with the Dalai Lama, and take immediate measures to eliminate any negative effects. Q: Mr. Moon Jae-in was elected today as the new president of the ROK. The Japanese government hopes to hold the China-Japan-ROK leaders' meeting at an early date. What is China's comment on that? A: We have answered many similar questions before regarding the China-Japan-ROK leaders' meeting. We always hold a positive attitude towards the cooperation between China, Japan and the ROK. As for the meeting, we think it requires the right atmosphere and proper timing. We will stay in touch with relevant parties on this issue. Q: There are reports about a major traffic accident in Weihai, Shandong Province on May 9, which led to the death of several children from China and the ROK. Can you brief us on this incident? What has China done in response? Did China communicate with the ROK? A: The major traffic accident in Weihai, Shandong Province has, so far, taken the life of 12 people, including children from China and the ROK. Highly concerned about this unfortunate incident, the Chinese leaders made important directions, asking relevant departments and local authorities to do their best to deal with the aftermath. Shandong Province and Weihai City have immediately activated their contingency plans, leading officials have rushed to the scene to direct the rescue work and make special arrangements to console and settle the bereaved families. 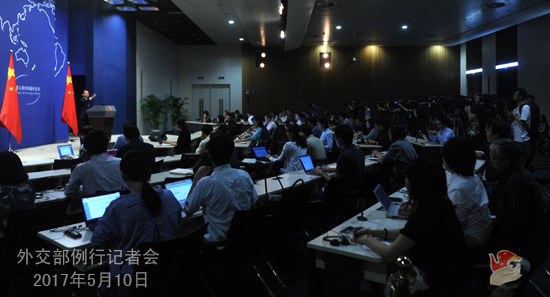 Relevant departments of Shandong Province held a press conference last night to provide relevant information. On the same evening, the Chinese side conveyed through the ROK side the Chinese leadership's deep sorrow for the victims and sincere condolences to the bereaved families. China will provide facilitation to the ROK families and other relevant people and work with the ROK to properly cope with the aftermath. 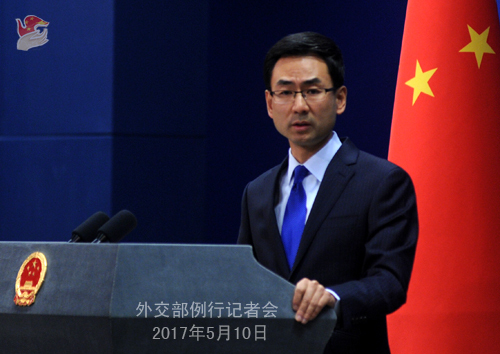 China will stay in touch with the ROK through diplomatic channels. Q: Does China have any plan to invite representatives of the new ROK administration to attend the Belt and Road Forum for International Cooperation? A: The Belt and Road initiative is an open and inclusive one. We will release relevant information, if any, in a timely fashion. Q: Pakistan's Prime Minister Nawaz Sharif and other world leaders will be attending the Belt and Road Forum on May 14 and 15. Would you like to share more information on arrangements for Prime Minister Sharif's meetings with Chinese top leadership? A: At the invitation of President Xi Jinping, Pakistan's Prime Minister Nawaz Sharif will attend the Belt and Road Forum for International Cooperation. All the participants are our guests, and as the host, China will show our warm hospitality to all our distinguished foreign guests, including those from Pakistan. Pakistan is an important partner of China in advancing the Belt and Road initiative. The China-Pakistan Economic Corridor, a pilot flagship project of the Belt and Road initiative, has already made positive progress. China believes that the attendance of Prime Minister Sharif will further promote international cooperation of the Belt and Road. Q: It is about the drafting of the Belt and Road Forum outcome document. Have you got any details you can release about how the process is going? A: I believe all of you are interested in the outcomes of the forum. As the host, China is currently discussing and consulting with participants to the Leaders Roundtable about an outcome document following the usual practices of international conferences and taking into consideration the opinions of various parties. As far as I know, we are making smooth progress in the discussion and consultation. I believe the document will be a product of joint consultation and showcase the consensus of leaders on promoting international cooperation of the Belt and Road initiative. Q: The new ROK President Moon Jae-in said he would visit Pyongyang under right circumstances. Will President Xi Jinping also visit Pyongyang under right circumstances? And in the affirmative case, what would be those circumstances? A: China and the DPRK are close neighbors who maintain normal exchanges and cooperation. With regard to arrangements for visits between the leaders, it depends on whether the two sides are convenient or not. Q: Were President Xi Jinping's comments to French President Macron about the Paris Agreement intended to pressure the US into honoring its commitments on climate change? A: As you might have already found, we have released information about President Xi's telephone conversation with President Macron. Both sides stressed that they should safeguard the outcomes of global governance including the Paris Agreement on climate change and increase communication and cooperation within the G20 framework. Climate change is a challenge for all. The Paris Agreement is a reflection of international consensus. China is firmly committed and determined to join hands with the international community and deal with climate change through cooperation.